specialists with little to no knowledge of mathematical modeling. Keywords: simulator, constructor, automated system, math model, training. 1. 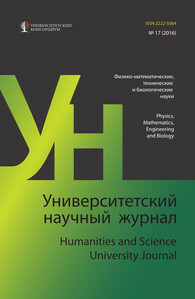 Rubshtein, A.V., Kantyshev, V.K., Dozortsev, V.M, Cherkasov, M.V., Potekhin, V.A., & Bogutsky, A.V. Roundtable “O&G and chemical industry technological process control efficiency improving decisions” [Круглый стол «Решения, повышающие эффективность управления технологическими процессами на предприятиях ТЭК и химической промышленности»]. Automation and IT in O&G Industry, 2013, No. 11(3), 2–12. расхожих заблуждений]. Plant Automation. 2003, No. 7, 29–33. Energy Agency Bulletin, 1985,Vol. 27, No. 3, 18–23. of Automation, 1998, No. 3, 38–41. Retrieved January 15, 2016, from http://www.cta. Fifth International Conference on, pp. 371−376. возможности, человеческий фактор]. Automation in Industry. 2015, No. 7, 8–20. 10. ISO/IEC 2382 36:2013. Learning education and training. Information Technology — Vocabulary. Pt. 36.